Dads don’t get enough credit for being the amazing fathers they are! Father’s Day is June 18th, and Mom’s Priority wants to help you find the perfect gifts for dad! Father’s Day is when we get to say thanks and celebrate the fatherly figure that influences our lives. It’s a chance to say thank you to that person who’s always there when we need him. 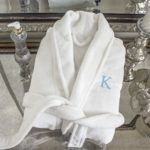 The following gift guide has some amazing personalized options to help tell dad you love him while making his big day a bit more special. A personalized knife would be useful and a thoughtful reminder for a handy, tool-loving dad. If dad loves watches and has too many glasses hanging around, this stylish organization box is the perfect gift for him. 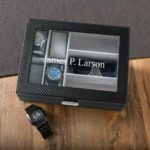 Not only can it be personalized for an extra special touch, but it is the perfect gift to help him stay organized and stop “misplacing” his favorite watch and glasses. 3. Backpack Cooler Chair: What a Great Idea! 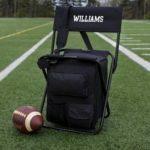 From tailgating to picnicking, dad will always make this the first accessory to bring. It’s a cooler that doubles as a chair that triples as a backpack. What more could he ask for? Having his name embroidered onto it! This is one of the ultimate gifts you can buy for Father’s Day. There’s never a bad time to replace your dad’s bbq kit, especially when they’re customized. This popular set is one of the best selling styles and will help inspire him to start cooking more this summer! Does dad love golf, bbq and tailgating? 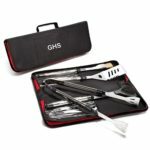 Why not give him the best of all worlds with this fun grill and golf bbq tool set. His eyes will light up as he sees his new favorite accessories and you’ll love as he starts grilling more and serving some awesome bbq this summer! There’s nothing more relaxing than lounging in a robe. Some dads would love this idea. Want something to give dad luck on the course? 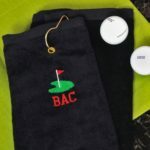 These monogrammed golf towels make the perfect gift that he can not only use, but have as a luck charm to help him stay under par!